Did I hear my Dad right? 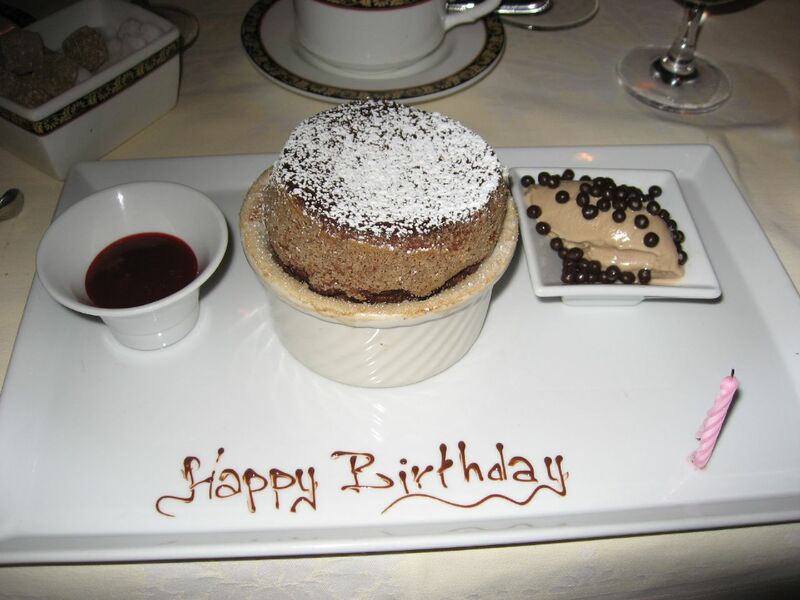 An opportunity to pick any restaurant in the DC area for my 31st birthday dinner? The gauntlet had been thrown down, and I was all too eager to face the challenging task of picking a restaurant to enjoy my last gourmet meal (presumably) before hitting the road. Marcel's, a French Belgian restaurant in Washington, DC, was ranked #9 on Washingtonian's Top 100 restaurants of 2007. Upon walking into the entrance, I immediately noticed the live piano being played in the bar area to our right. Directly in front of us, up a few stairs, was a view of the kitchen. The host was slightly to our left, and quickly arranged for us to be seated (we were 30 minutes early for our reservation). On the host's table, there were four pairs of spectacles laid out for those who might need a little extra help reading the menu. 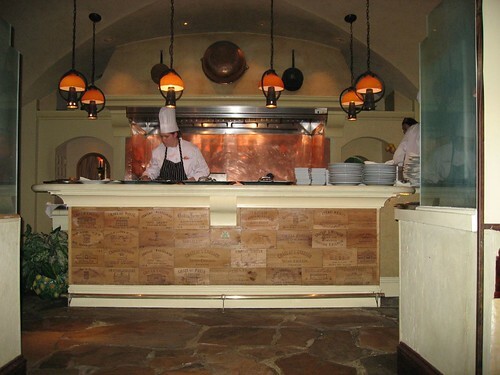 We were immediately shown to our table in the dimly lit main dining room, which looked exactly like the photograph on the restaurant's website. The understated interior design was one of the reasons I picked Marcel's. From my seat, I had a slight view of a female chef in the raised kitchen. The ambiance was comfortable, and the service fantastic. After a round of cocktails, the chef sent out a small treat, an amuse bouche of salmon with capers. I learned about such treats on Bravo's Top Chef. They're usually a one-bite palette cleanser served at the start of a meal. Little surprise dishes “from the chef” are a very good sign of things to come! For my appetizer, I chose an Alaskan Salmon Ravioli. My Mom went with Gratin of Mussels, Roasted Garlic Cream Fondue of Tomatoes, and Baby Spinach. 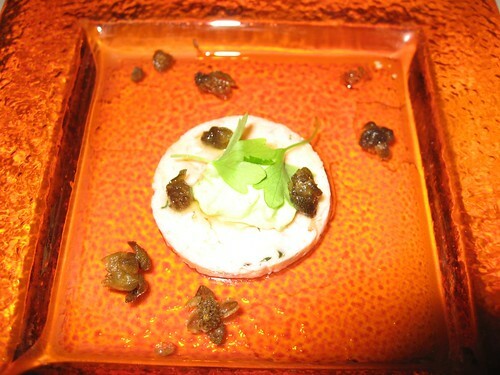 My Dad chose a house specialty, Boudin Blanc with Celery Root Puree Truffle and Red Wine Essence. 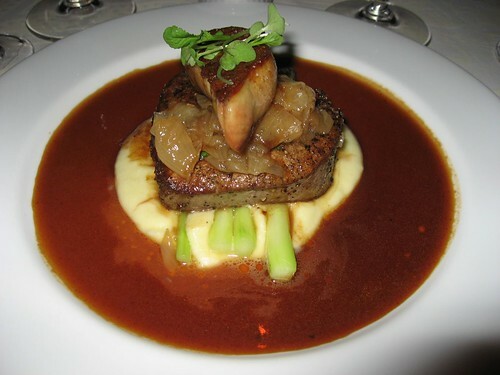 Boudin Blanc is a creamy mousse of chicken and pheasant shaped in the form of a sausage. It wasn't quite what my Dad had in mind, though I enjoyed it! I was not shy about using my camera, however I didn't realize the “indoor” setting wasn't appropriate until I was photographing our main courses. Yes, I have no shame, and I'm sure the multiple flashes caught everyone else's attention. It was my birthday though, and I was about to eat a meal I didn't want to soon forget. I've eaten a lot of filet's, however I'm hard pressed to remember one so perfectly cooked to a medium rare, and seasoned to perfection, as the specimen placed before me during this meal. The foie gras was pure indulgence (my apologies to geese), the asparagus tender with a nice crunch. The sauce was very rich, and I only wanted for a little more of the mashed potatoes. I always gravitate to chocolate desserts, so I went with the souffle. It was served with a chocolate ice cream, though the exact name of the flavor or brand was something unfamiliar to me. I thought the candle and “Happy Birthday” was playful in a sophisticated way. 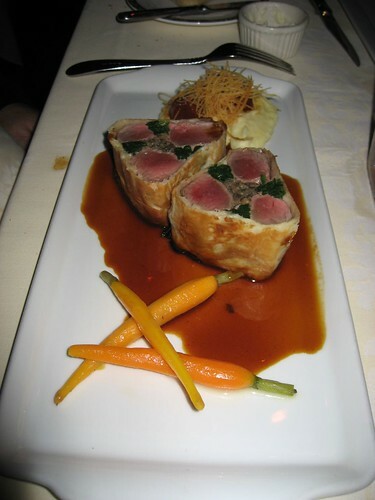 Chef Robert Wiedmaier's Marcel's is located at 2401 Pennsylvania Ave., NW, Washington, DC 20037. Dinner is served 7 days a week, starting at 5:30pm. Reservations are accepted online through OpenTable.com. Phone: 202-296-1166.
nice! Top Chef is probably my fav show on tv even tho we are going to cancel our cable tv. Wow the food looks great, and your pictures are awesome that camera will get some good pics on the road!!! seriously the fillet picture is making me hungry; wow! that looks really good. Took me awhile to read all the comments, but I really enjoyed the article. It proved to be very useful to me and I am sure to all the commenters here! It’s always nice when you can not only be informed, but also engaged! I’m sure you had fun writing this article.